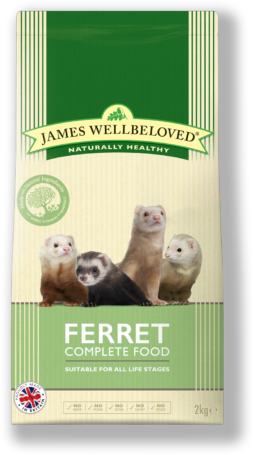 Can I switch my ferret to James Wellbeloved ferret food straightaway? Your ferret’s digestive system isn’t as quick as yours at adapting when switching diets. So, when moving them on to our ferret food, we recommend that you gradually introduce it over 5 – 7 days. Mixing a little of the new James Wellbeloved ferret food in with your ferret’s old food will help him get a taste for the new food. If this is the first time your ferret has had dry food you can moisten it with a little warm water but as free feeding is best for ferrets we would recommend feeding the food dry to ensure it is fresh and safe for your ferret each time he visits the bowl.